The chastening power of our Lord is wonderfully revealed in the life of John Mark, the author of the shortest of the four gospels, The Gospel of Mark. Just a few years before he wrote his gospel, Mark failed the Lord when he deserted Paul and Barnabas at Perga and returned to Jerusalem but the Lord restored him and used him to be a faithful minister and the writer of an inspired gospel. When a great servant of God writes a commentary on an inspired servant of God’s Gospel, great things are bound to happen. 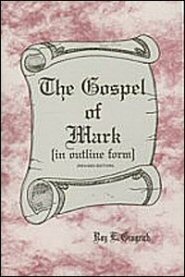 And in Brother Gingrich’s outline commentary of The Gospel of Mark, like in his other works, great things do happen.